My name is Csaba Grózer. I live in Hungary. I have an archery workshop in a small village called Feketeerdõ. 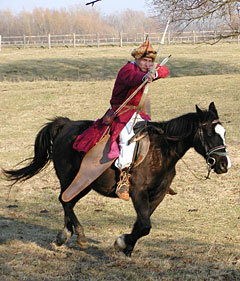 As long as I can remember, I've always been interested in nature...horses, birds of prey, and ancient eastern culture. In my childhood, every spring, when the weather was getting milder, I felt the calling of a strange, irresistible force. It was a sensation like the migratory bird must feel when it is time to fly. In those days, I didn't know what that could have meant, but it made me try anything to be able to be around horses, watching birds of prey for hours, or experimenting with different materials in making bows. Later, when other kids "grew out of" archery, I still felt interested. I also had a growing urge to make bows over and over again. Besides, I could never afford to buy a bow for myself. 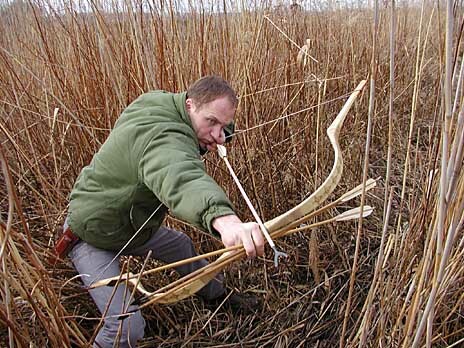 In time, I realized that the place where I live is a great treasury of eastern reflex bows. 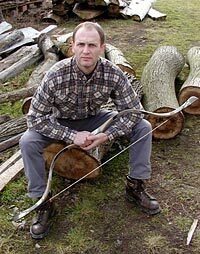 Here I could find every kind of bow, from Scythian to Turkish, in different historical periods.I was fascinated by the variety of special materials used in the process of making bows...horn of the Hungarian grey steer, special kinds of joined pieces of wood, tendons, glues cooked from special materials, antlers of red deer, and birch bark. Some of the above mentioned materials could almost be regarded as living fossils . The more I got into making these Scythian, Hun, and Avar bows, the more I gave in to those strange feelings. I felt I had popped into a magical place. Of course that place was still the place where I lived, but it seemed I was looking at things from another dimension, defying space and time. When I sat on my horse with my bow in my hand I felt like I'd gotten something back that I had missed for a long time., but all my great empathy for archery alone hadn't been enough. 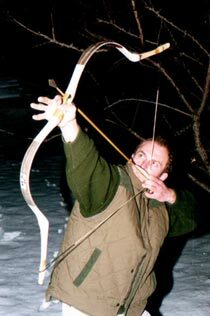 Fortunately, an archeologist named Dr. Gyula Fábián helped me a lot with his experience and essays about bows, many of which he also constructed. Of course I could name many people who also helped me with their knowledge,. These days we make very many types of bows, and I still am not bored with them. I realized that many secrets are "coded" into these bows, like proper torsion, or protecting the wooden core from breaking, for example. Of course, I don't only make bows of traditional components, but I also can fashion bows of modern materials for reasons of economy. These can be "mass produced" so they are cheaper, more accessible, but they are exact copies of the originals as far as look and operation. I created this advertisement to inform you about my products and to help you in contacting me from anywhere around the world.